Today’s rankings revived in my mind the effort that many of us jointly made last year to try to convince US News to standardize the employment numbers by state, just as they do bar passage. The slow recovery of California’s economy, compared with the rest of the nation, has had a deleterious effect on all of us, once again; and it’s particularly cruel to our students, who are punished twice: once by the difficulty of getting a job, and a second time by falling US News rankings of their law school. What I had proposed to US News was simple. Each school would designate the state where the largest number of its graduates get jobs. The percentage of each law school’s graduates with jobs would then be normalized by the state’s unemployment rate compared with the national unemployment rate. They already do this with bar passage. For instance, suppose the University of Iowa and X University in California both had 70% of its graduates with jobs at the date chosen by US News. The unemployment rate in Iowa is 4.2%. The unemployment rate in California is 8.3%. The national unemployment rate is 6.7%. (All numbers from December, 2013, for illustration purposes only.) Thus, the 70% number coming from the California school should be more impressive than the 70% number coming from the Iowa school. The “normalization” would multiply 70% by (93.3 / 91.7) for California, yielding 71.2%; and 70% multiplied by (93.3 / 95.8) for Iowa, yielding 68.2%. I would like to renew my approach to US News to adopt this approach. Last year, I heard back from Bob Morse, and shared with you, that he wanted more detail as to how to calculate this normalization. I sent him the simple approach, replicated above, and a more complex approach using the US Department of Labor, Bureau of Labor Statistics data on lawyer employment in each state. He appeared interested but ultimately did not make the change. 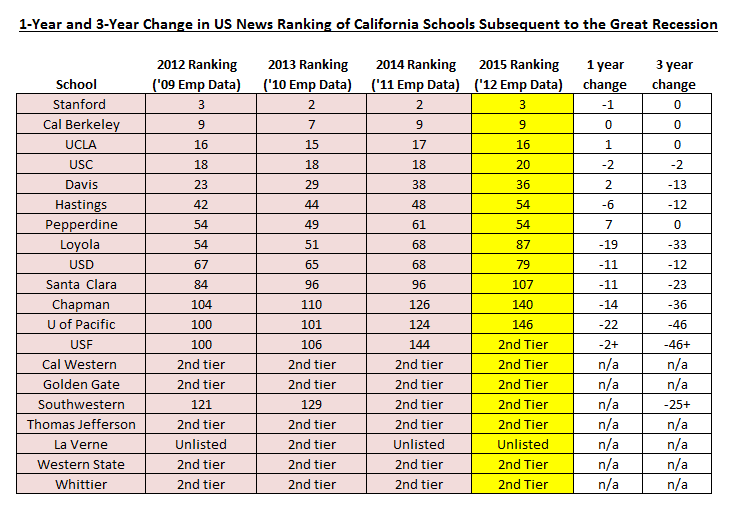 Here is a chart I calculated that shows the “California effect” on our rankings. Over the last three years of the Great Recession shown, not one of us improved in the US News rankings; yet that had nothing to do with the quality of education we each provide. Please feel free to use this chart in any way you wish, and this email message as well. May I kindly ask to hear from you again at your convenience?